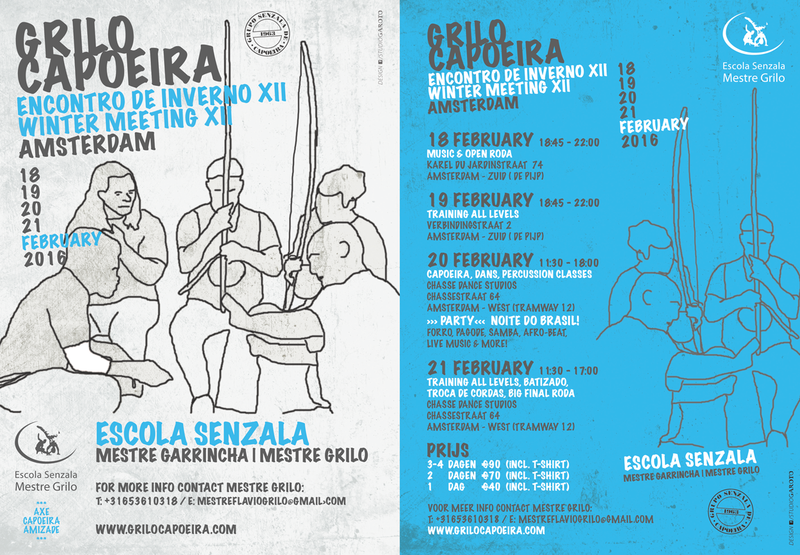 Ieder jaar organiseert Grilo Capoeira de Encontro de Inverno. Een meerdaagse capoeira meeting in Amsterdam, een capoeira evenement met workshops van verschillende mestres op gebied van capoeira, percussie, dans en meer. Capoeira mestres and teachers from Europe and Brasil will be teaching classes for all levels. Plus special dance- and music classes. Bring your instruments! With live band; samba, forro, pagode, capoeira, caiprinha, and more. Dinner at 19:00, for more info contact mestre Grilo. (Cafe Noorderlicht, NDSM Plein 102, 1033 WB, noorderlichtcafe.nl, ferry from Central Station). Nightbus 763 goes back to Central Station every 30 minutes, last one at 3.32 hours.